Controversy remains high over the effectiveness of the newly approved anticorruption law designed to better tackle graft among public officials, journalists and school teachers in South Korea, which is scheduled to take effect from Sept. 28. The nation’s Anti-Corruption and Civil Rights Commission on Monday issued an advance notice of the legislation, announcing that receiving gifts worth more than 50,000 won ($42) will be banned for government officials and those who work in the fields of media and education. Money gifts for milestone events, such as funerals and weddings, will be limited to 100,000 won ($86) or less. The announcement also added that those who get treated to a meal costing more than 30,000 won ($26) will be subject to fines. While corruptive deeds should not be an “economic drive” in any country, critics of the legislation have been arguing that the law may cause severe damage to the local economy, especially its food, Korean beef and flower industries. 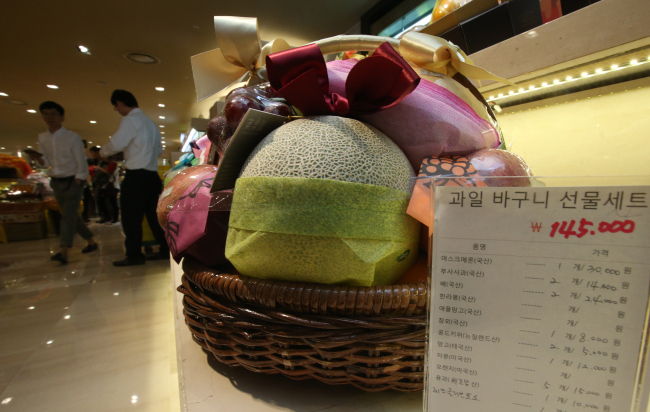 Korean beef and other food items are popular choices for gifts exchanged among high-ranking figures and public officials here. In response to this, President Park Geun-hye last month said the law may “shrink economy too much” and that she hoped a possible revision could be considered at the National Assembly before the law is enforced in September. “The law will severely affect the Korean beef industry and it seems like we need some revisions to protect the industry,” said ruling Saenuri Party floor leader Rep. Chung Jin-suk on Tuesday. Rep. Kim Kwang-lim, the chief policymaker of the conservative party, also said he has been receiving many complaints from the National Agricultural Cooperative Federation and the National Federation of Fisheries Cooperatives. “Maybe there should be an exemption for national holidays such as Seollal (the Korean New Year), as it is linked to the traditional Korean customs and traditions,” Kim said. The so-called Kim Young-ran law was first proposed back in 2011 by the eponymous judge, who was the head of the ACCRC at the time. The bill has been a subject of debate ever since the proposal was approved by congress back in 2012. Last year, South Korea ranked bottom -- 133rd place -- in policy making transparency among 144 countries, 97th in its trust in politicians and 82nd in judicial independence. The nation also scored 56 out of 100 -- with 100 being very clean and 0 being highly corrupt -- in the Corruption Perceptions Index published by Transparency International in 2015, significantly lower than the OECD average of 69.6. Contrary to what President Park and other politicians say, local think tank Hyundai Research Institute, had argued back in 2012 that Korea’s economic growth rate would increase by 0.65 percentage points if its Corruption Perceptions Index gets raised to the OECD average. Other critics of the anticorruption law point out that the law does not mention anything about preventing public officials’ children from receiving unjust benefits when applying for jobs or schools. According to the ACCRC, an article related to preventing conflict of interests was included in the initial proposal, but was removed while being reviewed by the congress. Last month, public criticism was sparked over the nation’s law school admission system after a survey by the government showed that some children of legal professionals entered prestigious schools by purposely “highlighting” their family backgrounds during the selection process. Some critics also say that the inclusion of parts of the private sector, such as the media and education, is potentially unconstitutional. “I agree that school teachers and journalists are just as morally responsible to the public as government officials,” said professor Choung Wan from Kyung Hee University Law School.